In many respects, this is old news, but why is it coming out now? 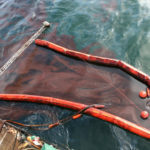 My analysis—studies continue to flow to reinforce the “not to be concerned” posture over irreducible minimum oil spill clean up, because folks, “Mother Nature knows how to take care of it herself.” Canada has just enacted their own regulations that reinforce this U.S. agency position giving free reign to toxic Corexit Dispersants for use on their offshore oil spills. This is bad news—because this research while seeming to be good news, will likely be used to encourage use of chemical dispersants (as ‘Nature’s helper‘) and/or the development and use of modified organisms for cleaning up spills, eeek! (Adding foreign species into the environment=not good!) However, the critical aspects of why this study is raises concerns are not discussed. Simple logic tells us that crude oil plus chemical dispersants disrupt a perfectly balanced ecosystem which includes a diverse population of bacteria (confirmed by this study). The diversity of bacteria/plankton populations is pushed out of alignment when there is a large oil spill, and even worse when dispersants are added, which then triggers a chain of negative environmental events. The line of logic in oil spill response needs to be simplified rather than obscured by pumping large quantities of smoke screened data into massive oil spill science data bases. It quickly detoxifies the oil (and other chemicals)–priority #1. This makes the spill harmless to a diverse range of oil eating bacteria present in the environment—NOT just those tough enough to survive it with synthetic chemical additives. Adding this process to existing methods for addressing oil spills including innovative physical removal skimming systems means solutions for oil and hazardous chemical spills are already in the tool box. Can you get more basic than that? LAEO’s research programs continue to work to inform scientists and government regulators that the the technology hoped for is here, already exists and has been cleaning up spills for 30 years — unfortunately that information is only just reaching the science community. We are hoping they will collaborate with us to better understand what is already working!